What do we mean by SINGLE-ORIGIN DAIRY? Watch this video to find out. Because THAT is our difference. THAT is why our milk tastes so good. Meet Facundo the bull. 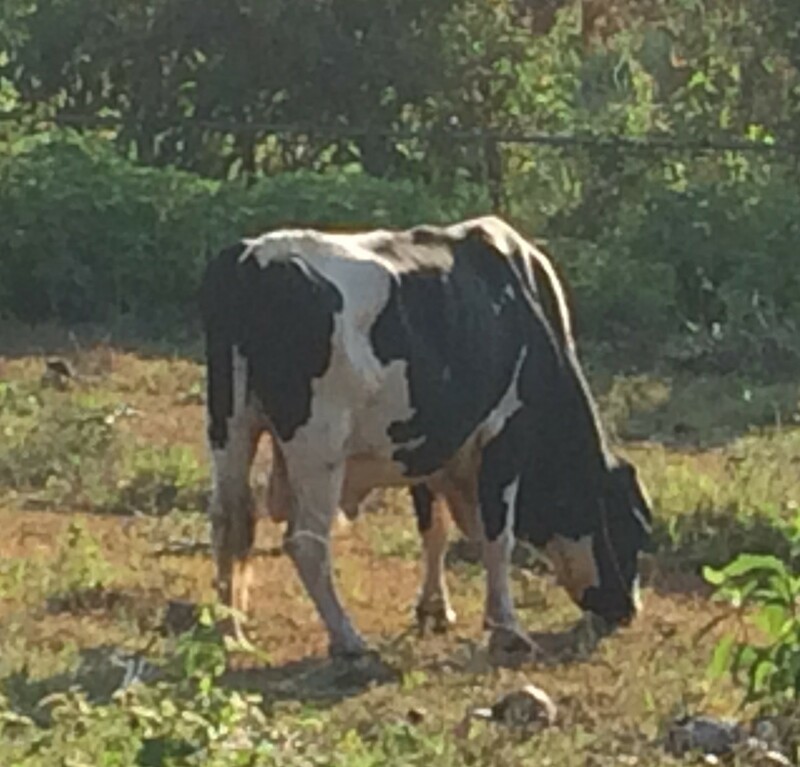 He has a happy life, munching away at the green grass of a little farm in Lipa, Batangas. He started as the lone bull in our farm, but now has serious competition from Bong-Bong, the young whipper-snapper. “All-natural milk from our own grass-fed cows” is a promise that Pinkie and Pinkie’s Farm take very seriously. While most local dairies augment their supply with milk from smaller farms, Pinkie’s Farm only sells what it produces. It is a SINGLE-ORIGIN DAIRY, which means all its products come only from one farm: PINKIE’S FARM. It is very limiting and frustrating because it means slow growth, but it is the only way that they can be 100% confident of their products. When Pinkie’s Farm started in 2009, it started with only 3 pregnant cows and selling most of its milk to bigger farms. Consultants from the University of the Philippines, Los Baños taught them how to pasteurize milk and to make kesong puti (local white cheese) and yogurt. Because Pinkie insisted on not using any extenders, preservatives, or additives, her products tasted much fresher and more natural, but sadly had such a short shelf life that she would not sell her products. She would rather just give them away to her family and her friends. It was only when people told her that there was a demand for all-natural products and non-UHT milk that she decided to sell her products to a very limited market. As her products grew in popularity, she added more items: Greek yogurt, yogurt cheese, flavored yogurt, frozen yogurt, and fresh butter! She liked seeing her little farm grow. Again, she never veered from her standards: all-natural, no preservatives, no additives. Even if it meant being more expensive, or taking much longer to produce, she knew that she wouldn’t sell it otherwise. The decision to use glass bottles was brought about by her desire to recycle and a salute to a more old-fashioned image. Pinkie’s Farm is a reflection of Pinkie’s traditional homespun values: simplicity, honesty, hard work, care for others, and uncompromising in quality of product and service. Facilities have been kept simple yet safe, with the welfare of the people and cows in mind. Pinkie herself will not think twice about helping out when needed, even if it means hosing down the barn herself. Concern for customer feedback and experience is high: she and her staff are sensitive to client’s comments. And above all, adherence to quality standards and safety (being FDA approved) is paramount. Pinkie is improving the cow barn and other facilities in order to welcome field trips from local schools, just so that she can spread the gospel of natural dairy. She loves the idea of having kids learn about where milk comes from, how butter is made, the joy of feeding calves, and being exposed to animals. Today Pinkie’s Farm is just slightly bigger, slightly busier, and slightly more developed. Growth has been slow but Pinkie was never really interested in being the biggest. Just the best.